My short list of art materials consists of those most useful to me on a path to abstraction, which is the basis for my acrylic paintings. A study of life, death, texture and typography in rural Northeast Texas. 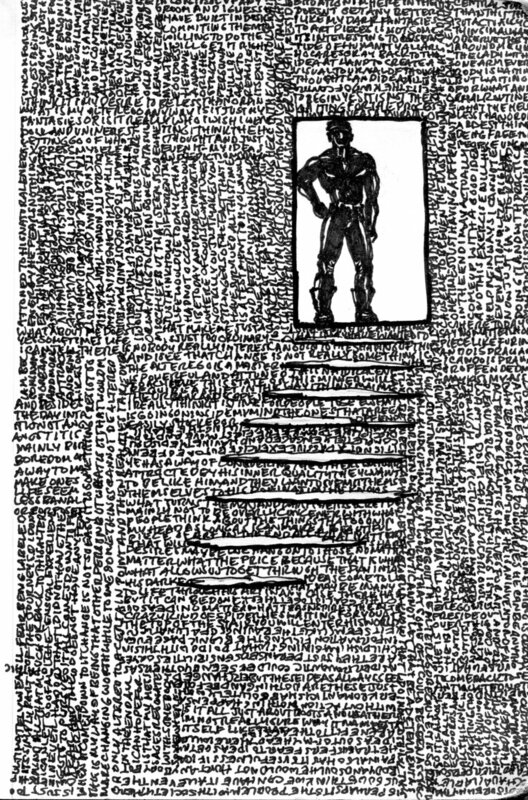 Essay by artist Gary Perrone. This title immediately puts me at odds with myself. I think writing is a good practice and an excellent use of time, however I believe one must be able to write about oneself, from an artist's perspective before taking on the difficulties of writing about another artist's work. Sometimes it seems undue pressure is placed upon artists to write about each other as way to establish credibility. Perhaps show the artist as something other than a self-absorbed extremist, living in an ivory tower. The fact remains, as a lifelong artist I am uniquely qualified to write about my own art. In my posts I intend to elaborate on my art through the eyes of an artist. I will, in effect document the philosophies that lead my art and life. I will share the people, subjects and things that inspire my creative spirit and the challenges I face as an artist today. Much that has to do with my current art creation has roots in my career in advertising. It is unavoidable as my career taught me discipline and how to break down a concept to find the kernel of creativity. It is annoying because I was an artist before I was an art director or graphic designer or any of those visually oriented occupations. As a student of advertising design writing was not part of the curriculum, although headlines and text were always needed. As I progressed through my career I found all creative projects started with written instructions of one kind or another. Thus, I and every other visual creative professional quickly realizes the importance of writers and indeed, many ad agency creative executives have backgrounds in writing and journalism, above visual arts. This makes it more of a challenge for visual types who may have a hard time putting the ethereal into words. As an art director I appreciated this particular reverence granted to writers and always strived to get my own "writing" in projects whenever possible. If ever some bit of advertising copy I penned made it through the creative process unedited or purged I felt a victory. In each case I did not let it be known I was the contributor. I felt there was an automatic bias towards anything I wrote, as there were hired writers on any given team. Being able to clearly communicate my ideas, my demands, whatever it is – verbally and in writing has always been important to me. Like anything one chooses to do well, practice helps. I have many notebooks and journals filled with mind dumps from years past. At some point I found journaling to be very valuable in terms of purging my mind of unproductive thoughts. I came to discover in retrospect some entries can be unintelligible. Even when journaling about a specific topic, say a bad breakup or trying to beat an addiction. Regardless, the journals are very important to my art. When I first started to paint, around Y2K I needed a reason, a concept. I love Dadaism but I was not about to throw paint in the air to see where it landed. I prefer to control the chaos of my art. My painting style came out of my desire to transfer my thoughts into color rather than words even though my thoughts are mainly verbal. When my mind races and becomes overwhelmed, there may be images and visions but whatever I experience is accompanied by a non-ending stream-of-consciousness – in words. I do not hear this, it is purely in my mind. I thought journaling would be an effective way of transferring my thoughts to a piece of paper through writing. I found a similar effect occurred when I put down writing-like marks of paint on a canvas, which in effect became a visual journal of the same stream-of-consciousness. This is the basic concept of my painting style. My journaling serves different purposes. While it can be therapeutic at times, at other times it is a useful tool for unlocking my creative mind. There are times when I have tried to incorporate written journaling into a visual piece because the words are so essential and an inescapable layer in the entire process. In the instances I have attempted this I encountered a very different journaling process. In this case, the writing, or rather the depicting of verbal language became very slow. Unlike the rapid and sometimes hysterical scribbling I found cathartic in my notebooks, in my painting each letter became a glyph that felt like it was being carved into place. I found my thoughts in temporary states of suspension (mantra) as I endeavored to bring my hand up to speed with my mind. Upon completion of four such panels I was exhilarated. Not only had I succeeded in fulfilling the vision of my paintings, but I also found the process itself to be transformative. I believe one can purge unproductive thoughts through writing and I believe writing can be very useful in setting the course of one’s life. When I journal with intent it is like repeating a mantra. For instance, I painted Streams at a time when I was feeling an extreme sense of existential restlessness. The first of a quartet, Streams represents the maximum. A barrage of nonstop chatter. The last of the panels, Be Still represents the minimum. The two panels in between, This Is and I Must are part verbal mashup and mantra, like a winding down to the quietude of Be Still. Purchased by a U.S. Federal Attorney in 2008. Of course, I realize journaling of this kind is not the same as storytelling. My paintings contain the transference of perceived thoughts as a form of creativity unique unto itself. Nevertheless, writing is essential to the creative process. Even for a visual artist such as myself. P.S. My life as an artist depends upon my generating revenue from my art and related services. I welcome replies, inquiries and opportunities. I am currently working on a series of watercolor images relating to the historical dead of northeastern Texas. You can find/purchase my available paintings at saatchiart.com. I am gratified to see I am transformable. I often hear people comment on how others are set in their ways or opposed to change. If I fear anything it would be my unwillingness to grow and adapt to new life situations. Around the turn of the century I worked on a painting. After it was finished I felt quite dissatisfied. There was nothing about it that did not look like something that had already been done and I was disturbed by that on a psychic level. I wanted to be original. From then on, I decided I would strive to create unique art and I soon learned the complexity of originality. As a formally-trained graphic designer and art director I spent most of my adult life in the service of corporate art departments and marketing agencies. During that time it was my job to “come up with something.” Ideally, to grab a blank sheet and begin conceptualizing ideas. Of course, in the career of any creative director there are times when originality is simply not possible, and when it does happen it seems accidental. Regardless, this kind of daily practice prepared me to come up with something when faced with the desire to make a painting, even though I found the blank canvas daunting. As I continued painting I began to make distinctions as to what I felt was unique in various techniques and subjects I explored. I formed tenets of what I would do and would not do in my paintings and ended up with a very short list of things I would do. So short, in fact I first decided to paint Nothing. Even there I was at odds since the concept of nothingness did not seem especially original. Philosophically, I realized there was no Nothing and became interested in the origination of thought itself. Thought is a given – constant. I wondered what thought looked like on an sub-atomic level and if I could paint that and whether or not it would look like – Nothing. I refer to these imaginings as stream-of-consciousness paintings. I paint in a certain manner and avoid any kind of proscribed painting techniques. All energy is focused on the point of contact where the brush meets the canvas. This represents a direct mind-to-art process. Over time I attempted to apply this style to representational subjects but found the stream of consciousness interrupted. It was not possible to see this as a spontaneous, nearly sub-conscious occurrence, as I had once felt it to be. This was painting by design. A tenet formed in my mind, at that point, that I should not paint from photographed subjects, but allow my paintings to be unique things in and of themselves. If I am influenced at all, it is by things that occur and appear in nature and the universe. This influence is not limited to things we can see. It comes from microscopic beauty as well as sounds only perceived in the mind. When I paint it is more like meditation than baking a cake. Recently I have been inspired by the work of Luigi Pericle Giovanetti. A treasure of paintings, studies and manuscripts by Pericle were discovered in his home studio in Ascona, Switzerland, fifteen years after his death in 2001. A skilled illustrator, he broke free of tradition, and in 1958 destroyed his entire body of figurative work to pursue new directions in abstraction and pure expression. To this purpose Pericle devoted the rest of his life to art and a quest for deeper spirituality, creating original works that emanate from a place of higher consciousness. It is not doodling and it is not drawing, but sometimes both. A study in contrasts. A love/hate relationship with trees. A brief discussion of painting with intent. I have relocated my artist's studio and home to Titus County in Northeast Texas.